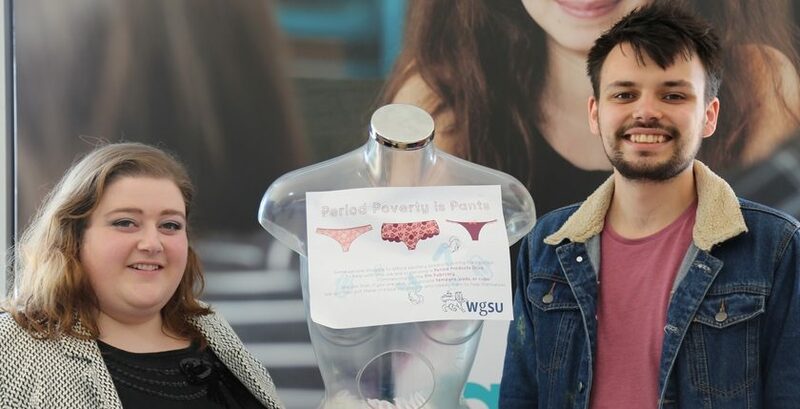 A campaign by Wrexham Glyndŵr University’s Students’ Union to tackle period poverty has been shortlisted for a national award. The campaign is one of eight which have been put forward for the participation award in the National Union of Students awards which take place on Wednesday July 4th. Period poverty occurs when women do not have enough money to afford sanitary products – with charities, foodbanks and others working to tackle the problem by providing supplies. The Student Union campaign which led to the shortlisting for this year’s awards aimed to tackle the issue by collecting sanitary products from students and staff and distributing them at specific points across campus. It is one the latest in a series of successes for the union this year, after it was named as Wales Higher Education Students’ Union of the Year at the NUS Wales awards in March. WGSU CEO Sarah Ellis said: “After setting up the campaign, we really did have a lot of donations – and I think it’s great how staff, as well as students got on board with the campaign and donated to it- we’ve had staff coming to us with donations from right across the University. Students’ Union President Angus Hamill-Stewart added: “It has also resonated really well with the local community – there was a real take up of items during Comic Con when that was held here, for example. As well as being shortlisted for the Participation award, WGSU are also set to have their success on the national Green Impact programme, which measures sustainability work recognised on the night. Officers at the union worked to improve sustainability and environmental issues, with their efforts paying off so well the Union moved from a ‘good’ rating to an ‘excellent’ one. Angus added: “It’s great that our work to make a greener Students’ Union is being marked – it’s something we have worked really hard on and an area where we have come so far. The work WGSU are carrying out in listening to students is also set to be in the spotlight next week. At the NUS Students’ Unions 2018 conference, which runs at the same time as the awards, Sarah is set to present some ground-breaking research she conducted as part of an MBA at Glyndŵr. The research – entitled “Won’t Somebody Please Think of the Students?” looks into the challenges of aligning long-term strategy in Students’ Unions with the views and opinions of sabbatical officers – who are elected each year. Sarah said: “Making the long-term strategy for Unions work with an annually changing group of sabbatical officers has long been a challenge for Students Unions. I spoke to Unions up and down the country as part of my research and I’m glad to be presenting it in a national forum. Read 1,227,082 times in last 30 days. Read 1,227,082 times in last 30 days, and 73,869,264 times since we started in 2011.